December 14, 2017 by Sandra 1 comment on "Best Watches For Kids Learning How To Tell Time – Cool Watches For Kids"
If you are looking for a watch to help your child learn how to tell time, then you have arrived on the right page. I have find a selection of watches that have been designed to make it easy for kids to learn how to tell time while having FUN at the same time. Some of the hour and minute hands on these watches are labelled to make it easy for kids to distinguish between hours and minutes. There are many different styles of watches for kids to choose from. Some of the time teacher watches on this page have character faces which makes it even more FUN for kids to wear their favorite character on their watch. Otherwise, let’s take a look at a selection of watches that are designed to help children learn how to tell time and see which ones are the best according to parents. I also have recommendations of other products that you can get to help supplement your child’s learning. This high quality kids watch is perfect for kids learning how to tell time with the minute and hour hand and the seconds marked around the outside of the watch. This watch features a round face housed in a stainless steel case. This children’s watch also features quartz movement with a leather band and buckle. This watch is not waterproof and it comes in an array of colors suitable for both boys and girls. 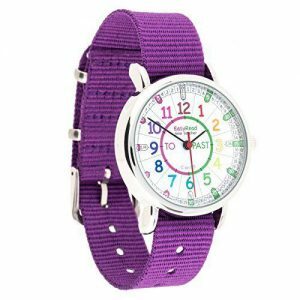 This EasyRead Time Teacher Children’s watch with the purple strap has an easy-to-read dial that is 1.3″ in diameter, with a multi-colored face, purple fabric strap and metal buckle. This watch is designed to help children learn how to tell the time in terms of ‘minutes past’ and ‘minutes to’ the hour. This watch comes with a simple 2-step teaching system instructions, which makes it easy for kids to learn how to tell time. This watch is battery operated with Seiko PC21s movement. It is water resistant and can withstand splashing but not total immersion. 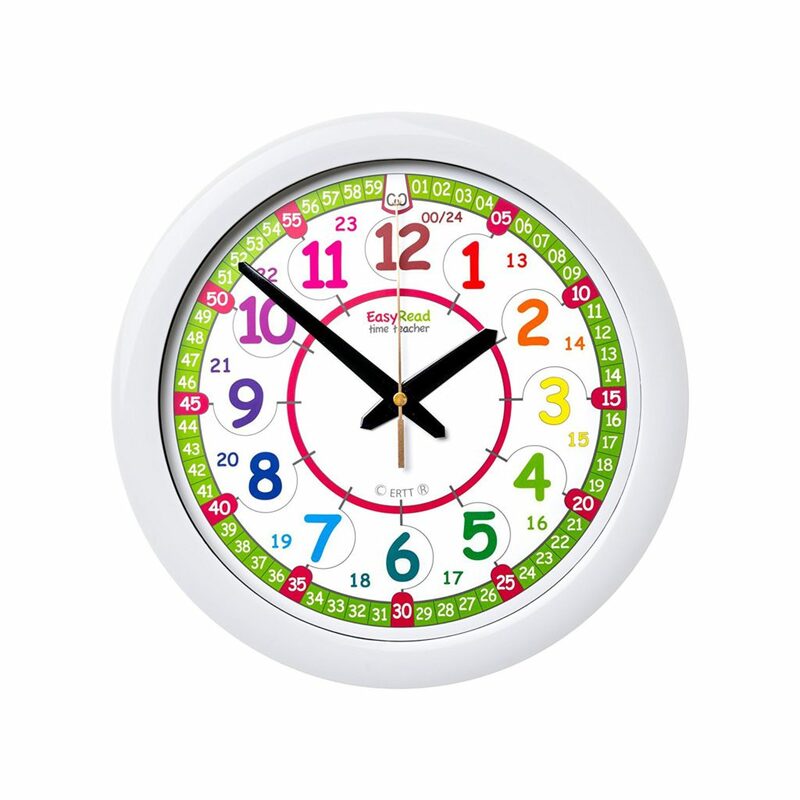 To supplement your child’s learning, why not consider getting the EasyRead Time Teacher Children’s Wall Clock, 12 & 24 Hour with silent movement. 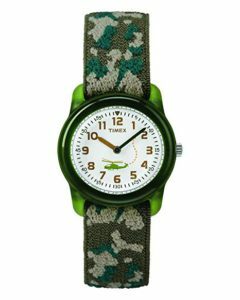 The Timex Boys Time Machines Analog Elastic Fabric Strap watch in ‘Green Geckos’ has an easy-to-read dial with minutes marked for learning. FUN rotating graphics act as the second hand for learning to tell time. The elastic fabric strap is adjustable as well as washable. This watch has a buckle for doing the watch up. This timex watch is water resistant to 30 meters. The watch movement is quartz analog. If your son or daughter LOVES geckos then they will have FUN learning how to tell time. Another Timex watch that is popular for boys is called….. The Timex Boys Time Machines Analog Elastic Fabric Strap Watch has an easy-to-read dial with multi-color hour hands and outer dial minute ring for learning how to tell time. FUN rotating graphics act as the second hand on this watch. The elastic fabric strap is adjustable for a comfortable fit and is also washable. This watch is water resistant to 30 meters and can withstand rain and splashes of water, but not showering or submersion. Lots of different colors and graphics to choose from. 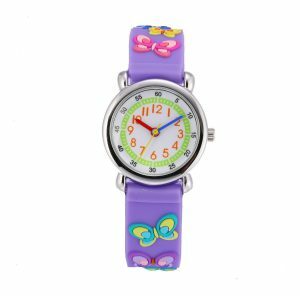 The Red Balloon Kids Time Teacher watch with a butterfly print makes learning how to tell time FUN for girls. This watch features the hands labelled with the hour and minute along with numbers 0 to 60 printed on the bezel. It also features a green fabric strap with a pretty butterfly graphics and a buckle closure. This watch is water resistant to 30 meters and the movement is quartz. I found this watch here on the ebay website. This Children’s Time Teacher watch is the PERFECT time teacher watch for girls learning how to tell time. The watch is durable and stain resistant.and features a 3D butterfly pattern. The hour hand is in ‘red’ while the minute hand is ‘blue’ to help distinguish between hours and minutes when learning how to tell time. Japanese Movement, provide precise and accurate time keeping. The watch can be worn when children are washing their hands or playing with water . But we do not recommend wearing this watch when swimming and bathing, because it does not have the depth waterproof function. The Kids Peppa Pig Time Teach watch with a purple strap features the hour and minutes hands labelled to make it easier for small children to learn how to tell time. This watch features Peppa pig print in the dial with an analog display. The numbers 0 to 60 are printed on the bezel and this watch features a buckle for a secure fit. Batteries are included. This watch is PERFECT for ages 3 years and up and would make a great Christmas or birthday present. What a FUN way for little girls to learn time. Another time teacher watch that is VERY popular with girls is called…. Disney’s Tinker Bell Kids’ Time Teacher Watch is an adorable kids’ watch with a white dial with pink & white hands, simulated crystal markers & pink Arabic numerals. This watch is water resistant to 30 meters, has quartz movement and a stainless steel case. The bezel is purple and the watch band is purple nylon and adjustable. The hour and minute hands are labelled to make it easier for kids just learning how to tell time. If your child is a Mickey Mouse Disney FAN, then here are some popular Disney Kids Mickey Mouse watches. 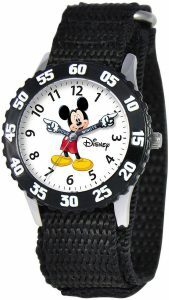 This Disney Kids Time Teacher watch features a silver-tone watch with Mickey Mouse graphic on a round dial, a numbered bezel, and labeled hour/minute hands. This watch also features a 32 mm metal case with glass dial window, quartz movement with analog display and a rubber band with buckle closure. This watch is not water resistant. This Mickey Mouse time teacher watch easily teaches the young ones how to tell time with hour and minutes markers clearly indicated on dial. With Mickey’s hands clearly pointing to the hour and minute markers, it’s easy for small children to tell time on this cute graphic watch. Easy-to-read numbers and labeled “hour” and “minute” hands keep it as simple as can be, while a numbered bezel and black self-adhesive strap combine to give this watch a sporty look. 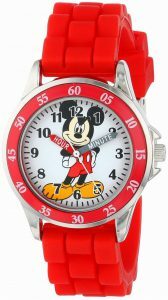 Another Disney Kids Mickey Mouse time teacher watch that your child might like is called…. The Disney Kids W000022 Time Teacher Stainless Steel Watch with Blue Nylon band displays Mickey Mouse from your favorite Disney character on the face, and is designed with labeled “hour” and “minute” hands to help young ones learn how to tell time faster. This classic watch has a polished and matte steel finish and a precision Japanese movement for accurate time keeping and a 1 year manufacturer warranty. 1 Comment on "Best Watches For Kids Learning How To Tell Time – Cool Watches For Kids"
I would love to be included in this list. We have released a high quality kids watch with learn to tell the time features. The posts on this site may contain affiliate links from Skimlinks, Shopstyle Collective, ShareASale and Viglink Merchants. At NO cost to YOU, we may receive compensation if you decide to make a purchase after clicking on any one of our authorized links. Copyright © 2019 Fun And Educational Toys For Kids Learning To Discover And Play. Powered by WordPress and Themelia.